Designed to meet the demands of a growing multitude of serious professionals, such as studio photographers, for whom exquisite detail is a vital part of their work, the D3X achieves resolution comparable to medium-format cameras — with an entirely new level of operating ease. It's perfect for the broadest range of detailed work, from fashion and product shootings, to weddings, architecture, landscapes and large poster production. And it shares the robust body structure of the D3, for superior mobility and operation in virtually any shooting environment, indoors or out. 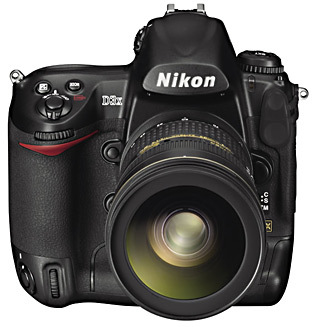 The Nikon D3 digital SLR, released November 2007, has garnered glowing tributes for image quality, sensitivity and speed performance from leading professional photographers throughout the world. This stunning success has prompted a mounting demand for a similar Nikon model that would offer a greater pixel count and higher resolution. A camera that would provide superb mobility and ergonomics while offering image quality equivalent to medium-format digital cameras. In response to these requests, Nikon has developed the D3X, an exciting new digital SLR with a Nikon FX-format CMOS sensor (35.9 x 24.0 mm sensing area) that delivers 24.5 effective megapixels, uses the same body structure as the D3, and boasts the same outstanding mobility and operability. The D3X employs a new Nikon FX-format CMOS sensor with 24.5 effective megapixels covering an area of 35.9 x 24.0 mm to achieve truly amazing resolution. What's more, we've optimized the pixel characteristics to provide a higher S/N ratio and wider dynamic range by securing a greater amount of light received by each pixel, thereby reducing lost highlights and shadows, and ensuring smoother tone reproduction with minimized noise. At normal setting, the D3X offers a wide range of sensitivity — from ISO 100, suitable for stroboscopic setting in studio shoots, to ISO 1600. It realizes superior image quality with less noise at ISO 1600 as well as at low sensitivity settings. What's more, the sensitivity range can be increased by two stops (up to ISO 6400 equivalent) and decreased by one stop (down to ISO 50 equivalent), offering an even greater diversity of shooting possibilities. Auto sensitivity control is also available. A new image processing system, based on Nikon's comprehensive EXPEED digital image processing and specially optimized for the D3X, provides superior image quality, faster processing speeds and lower power consumption. This advanced system achieves precise color reproduction for the broadest spectrum of hues, plus vivid saturation and smooth gradation, conveying colors as you see them, even with the slight changes in color tones you perceive. Furthermore, Nikon's advanced noise processing function, which was designed to minimize noise occurrence, achieves this without interfering with other factors, including hue. Just like the D3, the D3X achieves a start-up time of 0.12 second*1 and a shutter release time lag of 0.04 second*3*4. It delivers a continuous shooting speed of approx. 5 frames per second in FX format (36 x 24) or 5:4 (30 x 24), and 7 frames per second in DX format (24 x 16)*4*5. Also, the D3X is fully compatible with UDMA, the new-generation high-speed card that enables 35 MB recording equivalent to the D3. The D3X is capable of recording approx. 7.1 MB (JPEG, image size L, NORMAL) of data captured in FX format at speeds of approx. 5 frames per second. *5: The maximum frame rate can be chosen using Custom setting d2 [Shooting speed]. The rate is tested under the following conditions: focus mode set to C, exposure mode set to S or M, shutter speed set to 1/250 sec. or faster, with other settings set to default. If VR is on when a VR lens is used, the indicated speed may not be attained. The maximum number of shots at the maximum frame rate is determined by the selected image size and quality. The frame rate slows when the memory buffer fills. As with the D3, the D3X recognizes subjects and shooting scenes using a 1,005-pixel RGB sensor that precisely controls exposure by detecting not only the brightness but the colors of the subjects as well. The results are applied to control Autofocus, Auto Exposure, i-TTL Balanced Fill-flash and Auto White Balance, thereby achieving control of the highest. The Multi-CAM 3500FX autofocus sensor module, originally incorporated in the D3, offers proven outstanding performance. All 51 focus points, including the 15 cross-type sensors located at the center, are effective in all AF NIKKOR lenses with a maximum aperture of f/5.6 or larger. Three AF-area modes — Single point, Dynamic-area AF and Auto-area AF — are available to maximize the use of the 51 focus points by selecting the most suitable one to match subject conditions. Moreover, in Scene Recognition System, subject identification and tracking information is applied to improve subject acquisition performance in Dynamic-area AF mode and focusing accuracy for human subjects in Auto-area AF mode. Magnesium alloy is used for the exterior cover, chassis and mirror box to ensure light weight and rugged reliability. Strict O-ring sealing at critical connected parts effectively restricts dust and moisture. 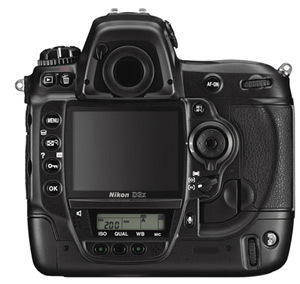 The shutter unit, developed and manufactured by Nikon, employs a new material (carbon fiber/Kevlar® hybrid) for the shutter blades, guaranteeing excellent durability through 300,000-cycle release tests with the shutter actually loaded. Precision is also maintained with a shutter monitor. The D3X incorporates a large, 3-inch LCD monitor with ultra-high resolution of approx. 920k-d­ots (VGA). Enlarged playback images also appear in extremely high resolution for easy focus confirmation. The wide viewing angle of 170° makes it easy to check composition in Live View shooting for both high and low angles. In Handheld mode, which allows the frame to be recomposed prior to actual shooting, ordinary TTL phase-difference AF using all 51 AF points is activated. Tripod mode is designed for precise focus with still subjects and tripod stabilization; it allows focal-plane contrast AF on a desired point within a specific area. Optional software Camera Control Pro 2 enables monitor focus and control shutter release from a computer. And optical Wireless Transmitter WT-4 enables wireless remote camera control and image transfer. Picture Control System offers four kinds of Picture Controls: Standard, Neutral, Vivid, and Monochrome. Choose one and use as is, or adjust image creation factors (Sharpening, Contrast, Brightness, Saturation, and Hue). 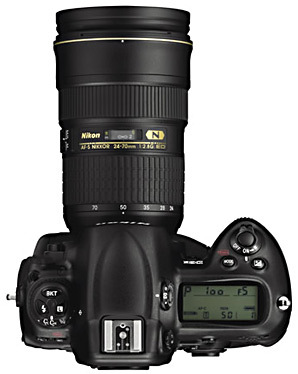 Optional Picture Controls (Portrait, Landscape, D2XMODE I, D2XMODE II and D2XMODE III) are available at the Nikon website for downloading and installation to your camera. In settings with strong contrast, Active D-Lighting, used in combination with 3D Matrix Metering II, determines an exposure by utilizing a gradation of highlights, detects lost shadows, then reproduces them after digital processing. Rather than simply expanding the dynamic range, Active D-Lighting prevents images from looking flat through localized tone control technology, and creates realistic contrast while compensating lost shadows and highlights. Choose from Auto, Extra High, High, Normal, Low or Off setting prior to shooting. An accelerator sensor incorporated in the body of the camera detects inclination and displays it in the LCD monitor. In Live View shooting, virtual horizon is displayed in the LCD above the monitor image. It can also be displayed in the top control panel and in the exposure indicator of the viewfinder. The CompactFlash (CF) card slots are UDMA-compatible for high-speed data transfer. With the double slot, you can choose from Continuous recording, Backup recording, and RAW + JPEG Separation recording (records the same image in RAW and JPEG on different cards). You can also copy the data from one card to another. GPS records shooting information such as latitude, longitude, altitude and date of shooting. Coordinated with map information, you can create an original map using images.